Create a collection with individual pieces that complement one another. Today’s home design leans more towards the eclectic than ever before. Blending genres, periods, patterns and colors has become an art form, in and of itself. The objective is to create an art collection in which the individual pieces complement each other as opposed to fighting against each other. Though perhaps a bit more of a challenge, the result is a unique and sophisticated space and a collector who has broadened their knowledge and appreciation for various styles and periods. Stephanie Stokes, Gallery manager of the Kodner Gallery, sees many younger collectors who prefer modern and contemporary art and design inheriting traditional artwork and furnishings from family members. Since these are heirloom pieces, it is important for them to display them and successfully mix them into their decor. She also sees traditional-style homes in Clayton and University City, for example, being purchased by young families with a more modern and contemporary taste in art and design seeking guidance on preserving the charming elements of these homes, such as stained glass and ornate woodworking, while highlighting the homeowner’s personal and updated style. 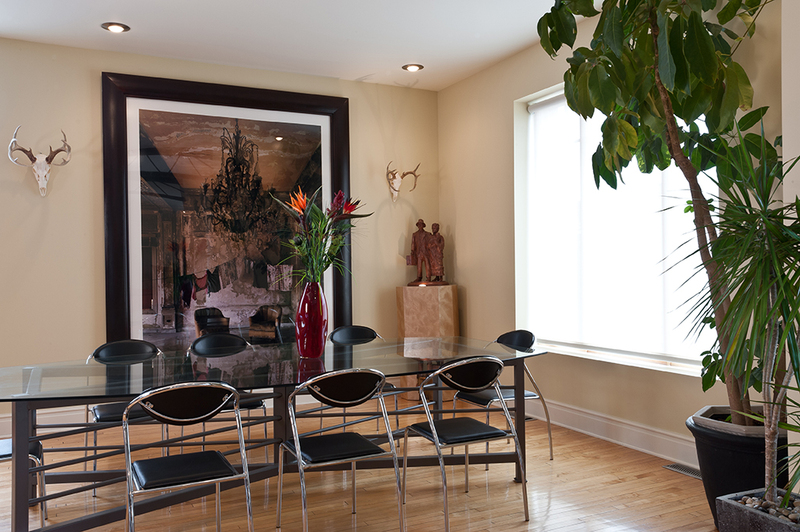 Mixing contemporary artwork with traditional furnishings, and vice versa, requires a keen eye for complementary pieces. For example, a traditional upholstered chair can highlight a corresponding color in an abstract painting. Contrasting elements, such as hard with soft or square with round, help to keep a room balanced and comfortable. For example, traditional furniture tends to have a bolder look with deeper colors and ornate details, as compared to today's more minimal furnishings. These heavier pieces are balanced well by the flat, solid colors of abstract paintings. Attention should also be paid to size, scale, shape and color so that one aspect of a room does not overwhelm the space. A focal point or statement piece in a room is great, but it shouldn’t be the only thing you notice. When done well, combining styles can bring out the best aspects of each piece. When investing in quality artwork and furnishings, it is important that both are highlighted equally. The result is a well-rounded space with a clean, yet cozy feeling, ideal for today’s young couples and families.